Despite the enormous need to preserve public-housing units amid what Obama’s first HUD secretary, Shaun Donovan, described as “the worst rental affordability crisis that this country has known,” the administration has not attempted to promote adequate congressional funding of the country’s vast repository of public housing. Whether this failure to push for full funding stems from ideological conviction or political expediency is unclear. What is clear is that advocates’ early hopes for a progressive Obama administration approach to affordable housing in general—and to public housing in specific—have given way to the reality of programs like RAD, launched in 2012, which lean heavily on the private sector for relief. RAD works by allowing public housing units to be transferred over to the Section 8, which relies on partnerships with private landlords. Part of the advantage of Section 8 is that its funding hasn’t suffered as much at the hands of Congress, but it will enable local housing authorities to seek mortgages and other private-sector equity more easily to pay for repairs, and makes Low Income Housing Tax Credits more accessible, thus drawing in private partners to invest in—and potentially own—the units as well. 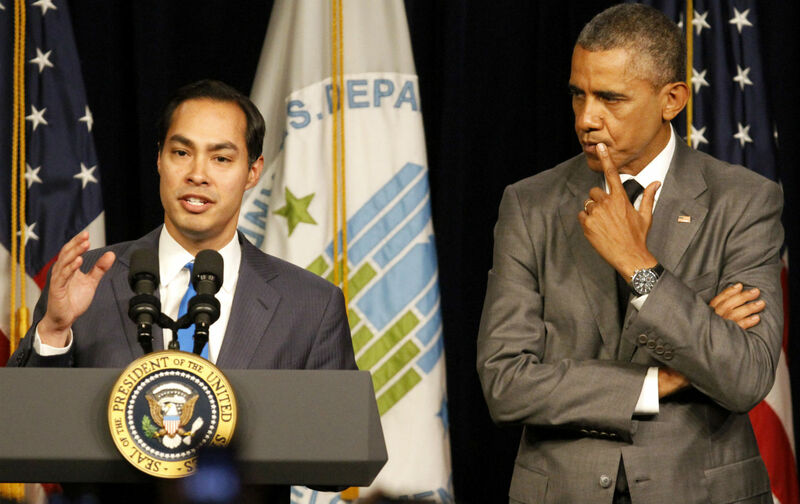 Yet, despite the Obama administration’s talk of solutions, public-housing residents have expressed a mix of concern and distrust about the program—and not without reason. The last time HUD came bearing glad tidings of renewal and revitalization, the policy—dubbed HOPE VI—resulted in the loss of 250,000 housing units. HOPE VI was a product of the Clinton administration’s efforts to break from the Democratic Party’s New Deal and Great Society heritage by retreating from the federal government’s commitment to the welfare state. The vast majority of the displaced families were African-American. Many of them never returned to public housing. Instead, their homes were often replaced by privately run, mixed-income complexes—with far fewer units for low-income people. The Obama administration claims that it wants to avoid a replay of the displacement caused by HOPE VI and that RAD is, above all, about improving conditions for public-housing residents. But tenant groups and housing advocates fear that RAD will ultimately mean another retreat from public housing. HUD does not specify the extent of the private sector’s role in units that are converted under RAD, instead leaving much to the discretion of local housing authorities. Outcomes are therefore likely to vary considerably according to their financing sophistication, political environment, and governing ideology. But provincial control of public housing has a long and checkered history. While the program was always funded and regulated by the federal government, construction, ownership, and maintenance remained a local affair. As a result, many housing authorities were staffed with incompetent patronage appointees who often proved incapable of providing services to high-needs populations. After decades of mismanagement, many local housing authorities happily took advantage of the HOPE VI program, which permitted divestment of their long-neglected holdings. The Philadelphia Housing Authority (PHA) typifies this fraught history. It is one of the nation’s largest housing authorities, with some 14,000 units in the public-housing program and $1.5 billion in capital-repair needs—but only $45 million a year to address that backlog. For long stretches of PHA’s history, the institution was a warren of patronage and corruption, which led to neglected units and negligent services. The city then lost 6,000 units to HOPE VI redevelopments. The combined weight of all this history has made tenant groups leery of RAD. PHA’s president and CEO, Kelvin Jeremiah, initially applied to convert 2,899 units under RAD, but the agency is attempting to increase the number to 3,800, or more than a quarter of its current stock. He insists the agency will still own the units and will take an active role in management (although maintenance could be contracted to a private partner). HUD requires housing authorities to meet with tenant groups both before the RAD conversion process and during the transition, and he says he has been using the opportunity to build trust with residents. The protections that HUD offers under RAD are much stronger than those that accompanied HOPE VI. Unlike the Clinton administration, Obama’s HUD guarantees one-for-one replacement: If affordable units must be demolished or extensively rehabbed during redevelopment, they must be replaced with the same exact number. Many tenants displaced under HOPE VI were prevented from returning to affordable housing complexes because developers and housing authorities changed eligibility statutes for tenants. In some cases they were screened for criminal backgrounds or substance abuse; in other cases, minor excuses—like a late payment on a single phone bill—were used to bar reentry. RAD does not allow returning tenants to be subjected to such indignities. Despite these assurances, advocates remain wary. Public-housing law allows residents to defend their tenancy and handle grievances without going to court, but these protections are not replicated exactly in RAD. Instead, the details of these rights are made contingent upon contracts between individual housing authorities and developers. Moreover, units converted to Section 8 are required to remain affordable for the duration of the contract, and when they expire, the contracts must be renewed. But there are loopholes that unscrupulous authorities could exploit—including one that allows a unit left vacant for two years to be converted to market rate. Mortgaging the complexes to help pay for repairs has its risks too, as American University’s Anne Marie Smetek noted in a lengthy review of RAD’s weaknesses, highlighting the danger of foreclosure—which would negate public protections—if housing authorities are allowed to leverage their properties freely. In Philadelphia, Jeremiah promises that PHA will maintain control of the land underneath the housing to ensure its affordability in perpetuity. (In her review, Smetek notes that housing authorities can defend against foreclosure by retaining ownership of the land beneath the buildings.) But housing authority ownership is not necessarily sufficient protection, as PHA’s own troubled past demonstrates. The priorities of the housing authority, and the political pressures on it, could very well change and leave the units vulnerable to conversion to market rate or other abuses. Moreover, any smaller housing authorities will not have the sophistication to maintain the control over the former public housing stock that PHA promises. Others may not have the inclination. In both Baltimore and Chicago, tenant groups and housing advocates have taken to the streets in outrage over what they describe as opaque deals between their housing authorities and private actors, according to articles in The American Prospect and In These Times. Clearly, fully funding the public-housing program would be a far more direct and effective way to provide affordable shelter for America’s low-income families. Yet many housing advocates seem to agree that, for all the questions about RAD, the program is the only way to get the needed repair money right now. There simply doesn’t seem to be another way to get the funds from a Republican-controlled Congress steeped in a political discourse that has long ignored the nuances and successes of public housing. And so, much will depend on tenant groups and housing advocates. In cities where they are powerful enough to monitor the housing authority and maintain their voices in the contracts, there is a better chance that RAD units will remain affordable. Both New York and San Francisco, for instance, have thriving tenant movements (and robust local media), which suggests that RAD experimentation will likely be closely watched. In other cities, which may have less rigorous institutions for maintaining accountability, the outcomes may be shakier. Donna Richardson, president of the Norris Apartments tenant council in North Philadelphia, was skeptical of RAD when the housing authority first brought the idea to her and the PHA’s other tenant groups. The rehabilitation of her complex will be so extensive that tenants will have to move out temporarily. Although Richardson was told that RAD ensures everyone the right to return, she got the housing authority to issue their own guarantees. “I did have it written, because we all know black and white works, and hearsay is just hearsay,” says Richardson. The agreement specifies that every resident has the right to return, with first priority, and that the housing authority will cover moving expenses. There will be no rent increases, credit checks, or any other screening procedures. Now Richardson backs the RAD plan. Jake BlumgartJake Blumgart is a writer and editor based in Philadelphia. Follow him on Twitter.